When you decided to build a flat roof, did you make a concerted effort to think about the roof membranes you’d use? The options available for roof membranes are considerable, and a lot of them determine how long they’re going to hold up over time. In some cases, those membranes may need replacing. This is especially true if you bought an old building for your business with roofing material already in place. However, the roof perhaps hasn’t been inspected in years, leaving you vulnerable to leaks. Those of you building a flat roof need to pay attention to the membrane you’re going to use. Part of your decision comes in the possible circumstances you’ll face later. In these cases, you may need a more durable membrane, or one requiring less maintenance. Here’s some options to consider. Often abbreviated as BUR, built-up roofing is one of the most common systems that builds up membrane layers. It’s been around for over a century and often used on flat roofs for commercial buildings. Basically, you’re building up several layers or more of bitumen. In-between, you may use asphalt, coal tar, or other adhesives. On top, you’ll usually place gravel, which is why BTU roofing usually gets called “tar & gravel” roofing. You’ll want to use this layered system if you intend to use your flat roof for heavy foot traffic. Keep in mind it brings far more weight, so you’ll need reinforcements during construction. As This Old House points out, BUR roofing now uses more advanced fiberglass membranes for further durability. Despite PVC being a single-ply option, it has similarity to BUR based on durability. PVC is extremely strong and can work well for moderate foot traffic. The single-ply aspect makes it a considerably different choice, taking less time during application. With a breaking point of 300 lbs. per inch, you could even have light car traffic on a flat roof like this. Beyond weight, though, is PVC’s ability to bring more energy efficiency to your business. White-colored PVC membranes reflect sunlight rather than absorbing, leading to less damage from UV rays. Otherwise known as Ethylene Propylene Diene Monomer, EPDM has a link to PVC only in being equally popular. The difference comes in price. The EPDM membrane is typically cheaper, despite still being extremely durable. Many call this rubber roofing because it’s a one-ply of synthetic rubber. It’s not as durable as PVC, yet it holds up for decades. Best of all, it prevents leaks, which is your main goal. With high durability to wind as well, it’s a good choice if you live in hurricane country. Here you have another single-ply membrane that’s only been around for a little over 25 years. The strongest suit of TPO is its energy efficiency, along with the same resiliency attributes of EPDM and PVC. “TPO” stands for thermoplastic polyolefin, which has three layers. It starts with a polymer base, a polyester center, and a top ply of aforementioned thermoplastic polyolefin. Along with economical aspects, it’s simple to install, saving you time when you need to use your flat roof for business purposes. Some prefer something even more durable than the options above. With modified bitumen, you get another layer of durability thanks to its resistance to tearing. The base layer here has plates or bars for reinforcement from sharp objects or collisions. This finishes off with a permanent adhesive for the ultimate in strength. 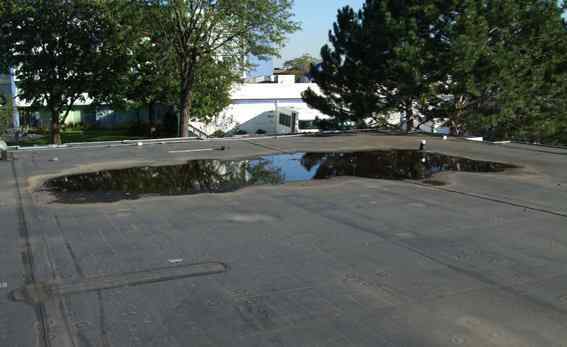 During times you allow car traffic on your flat roof, this is the strongest choice to prevent any potential damage. In climates where you get a lot of heavy rain or hail, you’ll have far more protection. Contact us at RoofSlope to ask about our RoofSlope® product to help eliminate ponding water, no matter what roof membrane is in place.